J: I just can’t seem to stay away from Fairfield, no matter how I try. The quaintness of the houses and the slower pace of its residents (and we’re not speaking of its seniors) holds my attention. To me, this area is idyllic. It’s close enough to downtown to enjoy the convenient shopping but it’s far enough away to enjoy a neighbourhood Sunday BBQ in peace. Perhaps in future I’ll rent a place here, for now, like a divorced man with no custody of his child, I’ll have to satisfy myself with the occasional visit. Today’s visit brought Ed and I to Fairfield’s Fish and Chips shop, located just half a block from Sir James Douglas School and the Fairfield United Church. The shop itself has been in business since 1995 but the property itself is far older. I was excited to find one very old pedestal sink in their washroom (I love vintage decor). E: Or James is feeling just that old, nostalgic for a forgotten time. The area does have a good vibe, but what sold me to coming here was the chance of enjoying the day. This shop is said to do some pretty mean burgers, and I was divided between fish n’ chips or a sloppy joe’s. The prices are quite reasonable to do both, but the daily special of rock fish n’ small chips at $6 made me turn Scot. With a drink, that’s a good meal for under $10! J: I must admit, the price did appeal to my kilted side. 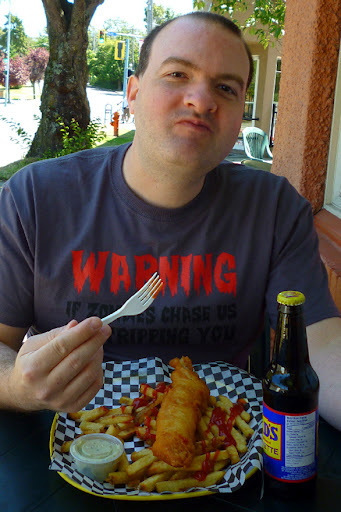 Other food blogs came, saw and reviewed the fish & chips. I was determined to do otherwise and wrangle myself a mean oyster burger. But the price was up there like a golden calf and I obeyed. I couldn’t settle on any of their drink options but I did settle on a Dad’s Root Beer from Clare Mart Foods next door. E: There’s always next time, James. I was feeling a little bit zombie today, and wished for brains as a side. Instead I devoured a juicy order of prawns which were amazingly quite good. They were not your garden variety wee lads, but some plump suckers with an equally bubbly batter to make these morsels difficult to stick in the containers of dip provided. Word to the wise: get two or three of them, if you want to soak the fries in a different sauce other than ketchup. J: I found the fries to be average and the rockfish delicious. I wish I knew what kind of fish it was but with taste like this, it was pointless of me to ask. The batter on the other hand I could’ve peeled like a banana skin and tossed it. Gosworth Fish & Chips had a much tastier batter. Fairfield’s was just bland. I’m loving the little shop itself but I’m missing the mark when it comes to the food. Perhaps I’ll order the oyster burger the next time and sink my teeth into the real taste I’ve been hearing about. 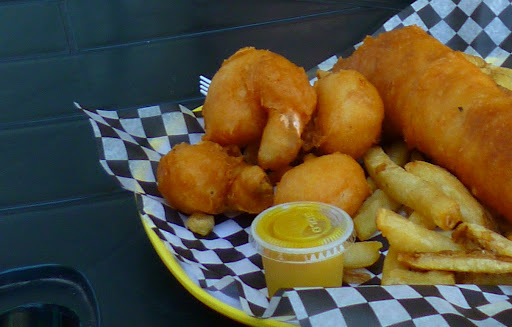 This entry was posted in Food, Reviews and tagged British Columbia, Fairfield, Fish and Chips, Vancouver Island, Victoria. Bookmark the permalink.